Tom Wenzel and Gerry Breen discuss service-based teamwork, design projects within Raven Applied Technology, and their roles as Raven Ambassadors. 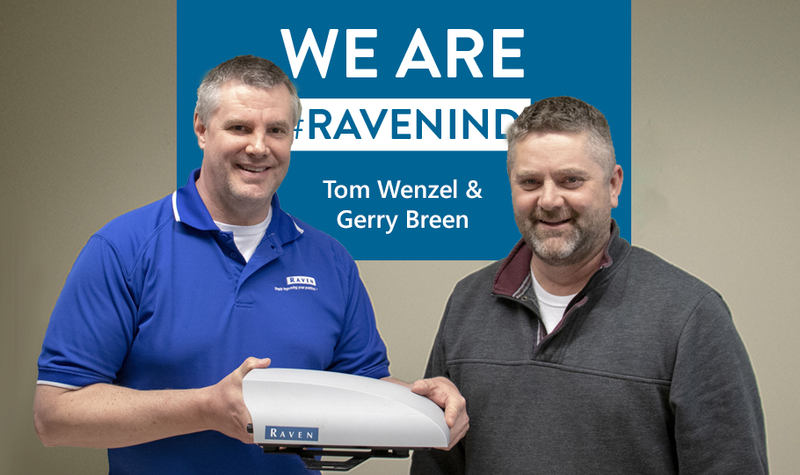 Tom Wenzel, Project Manager, and Gerry Breen, Engineering Technician, are both heavily involved in the engineering design process for Raven Applied Technology. They work directly together — “Tom tells me what to do, and I do it for him,” Gerry said with a smile. In the design architecture of Raven Applied Technology, Tom is the self-proclaimed “janitor” — as the project manager, he is responsible for keeping things flowing, facilitating success, and (on rare occasions) mopping up messes. Gerry, as the engineering technician, determines whether or not tasks can be accomplished in specific timelines, or how they can be accomplished more efficiently. In the big picture, what they do is critical to the success of the company. These project decisions, and the execution thereof, determine which products are developed and which improvements are made to our precision agriculture products. How do Tom and Gerry keep track of all our different products, enhancements, and processes? When asked, they said, “You have a lot of good people helping you out.” They added that this doesn’t just pertain to their projects — it also speaks to the Raven Culture and values, which contribute directly to outstanding service, both inside and outside the company. The value of service is present and active at all levels at Raven — and the same can truly be said for all of our Team Member Values and Dimensions of Competition. A project for Applied Technology may involve input from many different departments, including manufacturing, engineering, technical service, and IT team members; and each are willing to support one another. Others — especially outreach projects that include the Raven Ambassadors — bring together team members across business units. Overall, this service mindset encourages collaboration and builds relationships across the company, allowing us to provide the best results possible. This doesn't just apply to our teammates at Raven — we are committed to providing outstanding service to our customers, as well. We are focused on helping feed a growing world, providing innovation for precision agriculture technology that delivers in the field. An important part in fulfilling this purpose is to ensure that our customers have the support that they need to effectively operate our products. As Gerry noted, “We don’t just design it and say, ‘It’s someone else’s problem now!’ We stand behind it after it’s done.” This includes supporting our customers through installation and technical support. Tom and Gerry are each part of the Raven Ambassadors, a group of highly-engaged team members that seek to make an impact, both inside and outside of Raven. They shared the same sentiment as to why they joined this group — they each wanted to make a positive difference in their workplace and community. Noticing that the next generation of farmers is having more of a say in the future of precision agriculture technology, Tom serves on the STEM subcommittee to help educate the next generation. As champions of our commitment to STEM, these team members travel to a variety of schools in our communities, providing interactive presentations and activities about Raven, our technologies, and various career paths in engineering and technology fields. The STEM program is exhilarating — it's a lot of fun. It is stressful, it is a lot of work — you do have to prepare for your presentation and be ready to go. But, at the end of the day, when you've left and then the feedback comes in — that the students were engaged and would like to learn more about Raven, more about engineering careers, and 'thank you, can you come again?' Those are the things that we are trying to do as a Raven Ambassador team." Gerry serves on the Team Member Engagement and Culture subcommittee. He has worked in three different Raven businesses over the course of his career — and initially joined to help facilitate communications throughout the company. Today, he is helping connect team members across all of our locations through various communications and activities. Raven Applied Technology is the third division that I've been with. I've seen firsthand how different our businesses are, and how they didn't always get the chance to interact with one other. I joined the Team Member Engagement & Culture subcommittee to help us stay connected as a company." When talking to Tom and Gerry, it’s easy to see that they are both passionate about Raven, each doing their part to make a difference in our company and communities; and that they, as well as the rest of the Raven team, work well together to Solve Great Challenges.